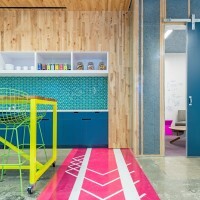 Studio O+A have designed a vibrant and colorful space in San Francisco, for Capital One bank employees to use design thinking to solve management challenges in banking. 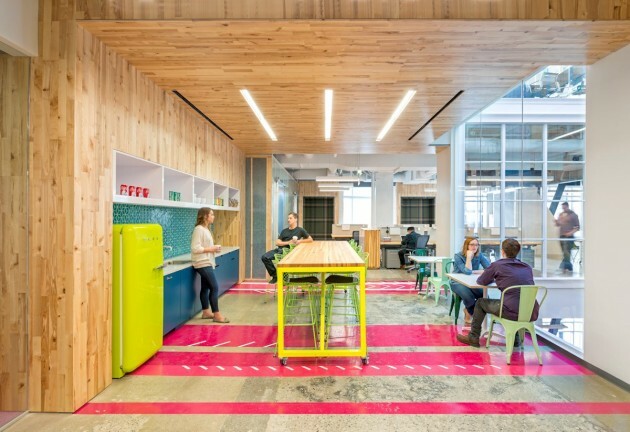 A bank is not a client to whom designers would normally suggest their most adventurous color choices, but the creative team at Capital One Labs in San Francisco was an exception. 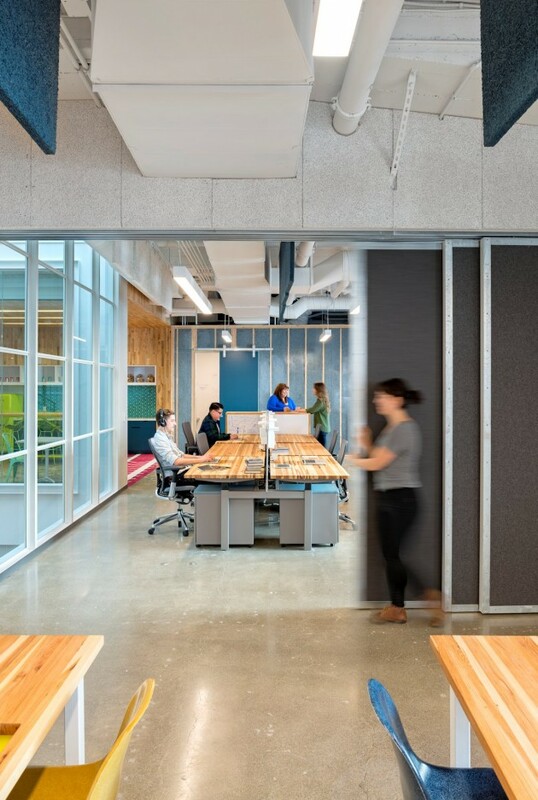 This group, which develops apps for easy and effective interface with Capital One’s online customers, wanted their space to reflect the wide open spirit of their team. 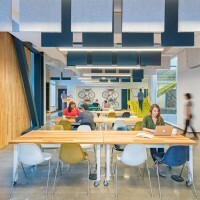 Capital One Labs is essentially a design studio, and the people who work there wanted it to look like one. They didn’t want to drape it in banker’s gray. O+A’s designers responded with a palette that arrests the eye. 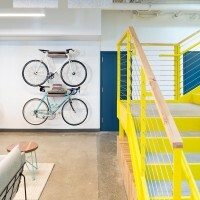 The colors chosen for the staircase, “Rustic Drama,” and the support beams, “Gabled Blue,” and the seating cushions, “Hot Pink,” and the refrigerator, “Lime Green,” came together in a way that was both vibrant and harmonious. “It was nice to have a client who was open to Hot Pink,” says Designer Alma Lopez. Color was just one aspect of a playfulness that extends throughout the design. 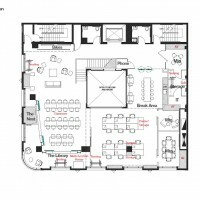 Responding to the client’s request that the new space include a place to rest, O+A went beyond a soft couch to create an elevated sleeping nook that is one of the central features of the space. 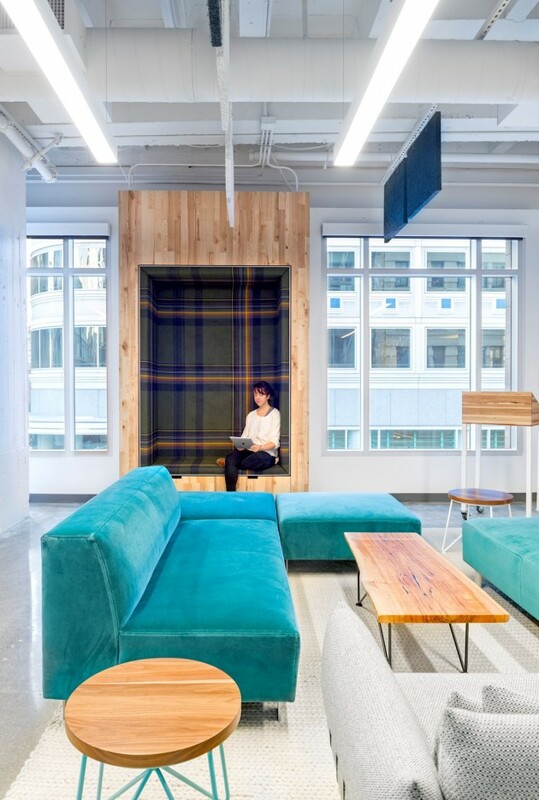 The nook, which is accessed by a ladder, recreates the cozy isolation of a treehouse while providing a practical retreat for Capital One’s hardworking employees—some of whom participate in one- and two-day brainstorming hack-a-thons during which no one gets much sleep. While the sleeping nook may be the most original of Capital One’s features, the most striking in visual terms is the staircase. 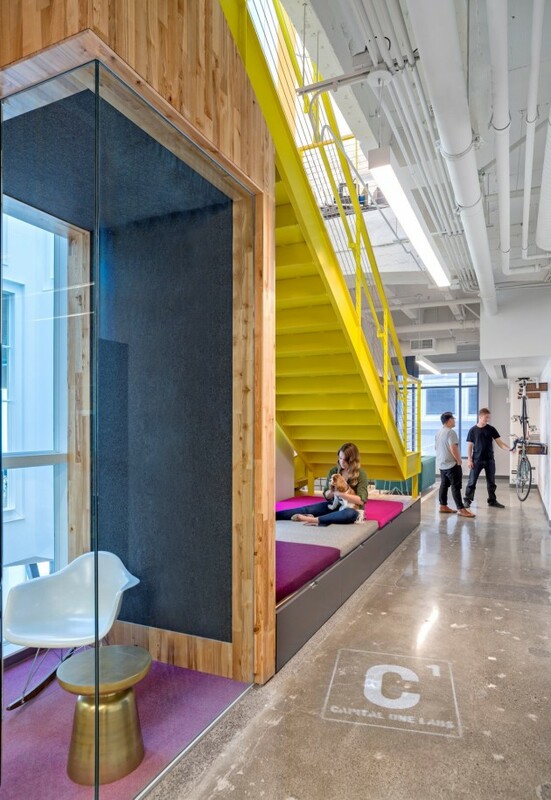 It is one of O+A’s core beliefs that purely functional elements—passageways, elevators, staircases—offer unique opportunities for design. 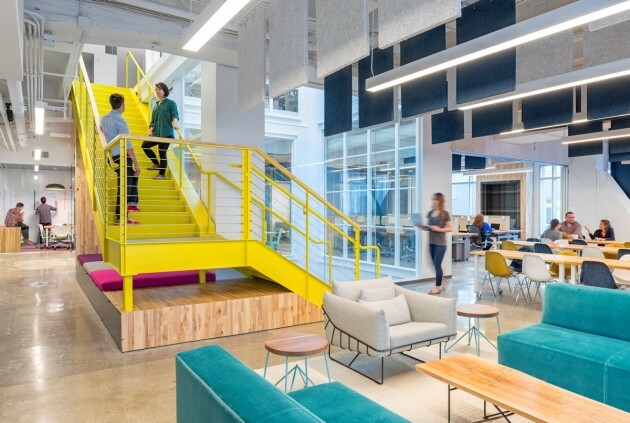 Connecting the second and third floors, not with a hidden stairwell, but with a centralized, bright yellow piece of vertical sculpture, accomplishes the practical object while adding the intangible value that comes from inhabiting well-made space. “You’re creating an experience coming down those stairs,” Lopez says. 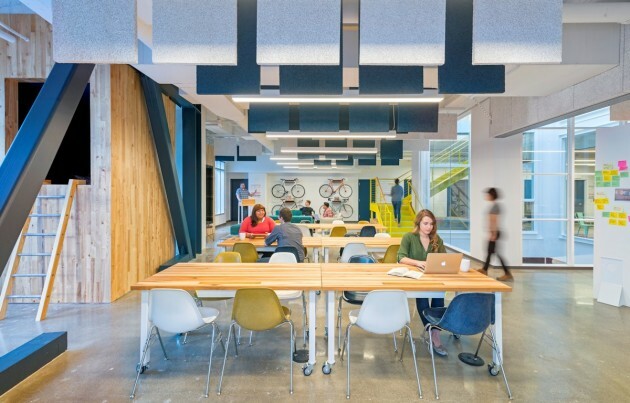 Creating an experience was the driving force behind all of O+A’s design choices for Capital One Labs. 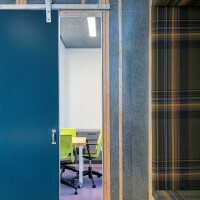 From the wall cubbies fitted out in Paul Smith plaid to the sound-absorbing Tectum panels suspended from the ceiling to the lime and pink kitchen and the phone room with recycled denim walls—every aspect of this environment is meant to enhance the experience of the creative people who are working in the space.